Let our team take all the stress out of your kitchen, Bedroom and furniture requirements. Book a free consultation and experience our Silver Spoon Service for yourself. We are here to help. Show stopping kitchens from Silver Spoon! 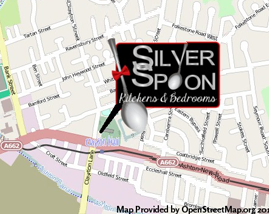 Silver Spoon Kitchens and Bedrooms offers an extensive range of delightful kitchen styles. We can help you to create a truly unique and personal finish in your home. Kitchens designed to suit your specific budget, taste and style of room. At Silver Spoon Kitchens, we don't believe that luxury kitchens should come at luxurious prices, which is why we strive to bring you an affordable, personalised experience with products that can suit virtually any budget.